A wild alchemist's brew, OM will help you find peace and center you within your space. This is one of the most unusual teas that we offer. The lemon grass and cinnamon provide a bit of sweetness and the Cardamom and ginger root give the perfect earthy notes. OM is closely related to the masala chai teas served in Nepal. I love this blend. 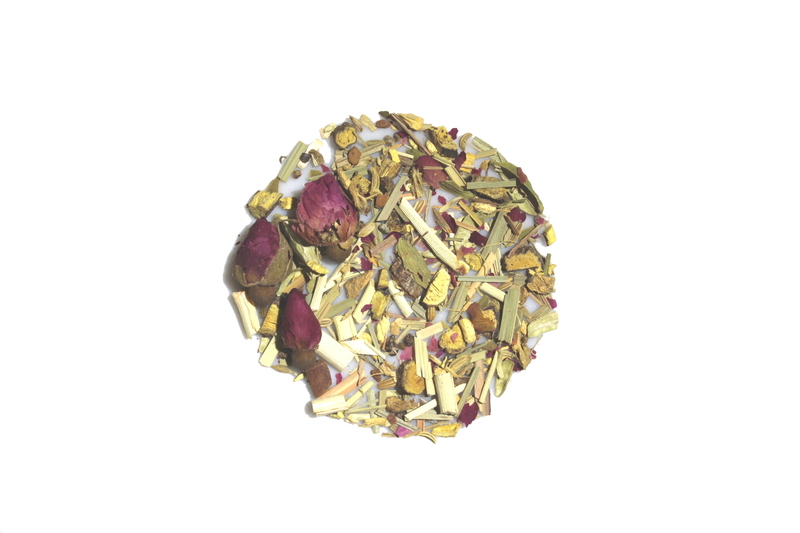 It is so hard to find flavorful herbals that don't have hibiscus, that is just one reason I enjoy this tea. The cardamon, rose, cinnamon, and ginger give it an amazingly rich flavor. How strong it is depends on how long and much you steep, it is perfect for me as the directions state. I loved most of the aspects of this tea. The flavors worked really well together, and I loved the floral/herbal taste. The only thing I can say about this one is that after the initial sips, a very sweet flavor started to overpower the lighter, more floral taste I loved about it. I will still drink it if I'm offered some, I just wont make a full cup so it won't be too sweet. I found this tea very relaxing... the taste wasn't too strong, but what really hooked me was the aftertaste - rose, I think? I love it! I am a fan of herbal teas and all the flavors sounded great. However, this tea was a bit too grassy tasting for me. I did try it hot, maybe would be better cold.